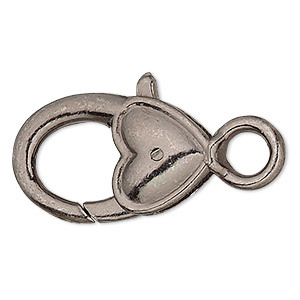 Clasp, lobster claw, gunmetal-plated "pewter" (zinc-based alloy), 21x12mm with double-sided smooth heart design, 4mm inner diameter loop. Sold per pkg of 6. Item Number: H20-A3941FN Have a question about this item? 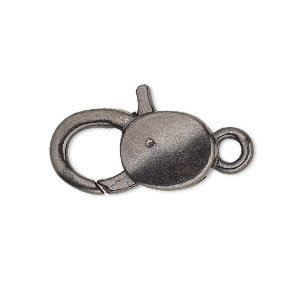 Get beautiful closure with attractive lobster claw clasps in "pewter" (zinc-based alloy). Zinc-based alloys allow designers to create intricately detailed, complex forms which hold their shape and polish well making them ideal for showcasing in jewelry designs. 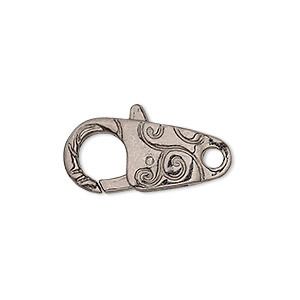 Clasp, lobster claw, gunmetal-plated "pewter" (zinc-based alloy), 24x12mm with double-sided swirl design. Sold per pkg of 6. 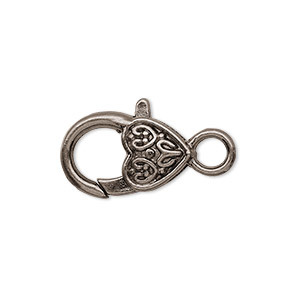 Clasp, lobster claw, gunmetal-plated "pewter" (zinc-based alloy), 20x12mm with double-sided swirl heart design. Sold per pkg of 6. 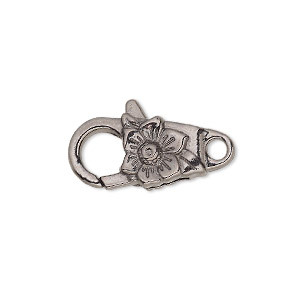 Clasp, lobster claw, gunmetal-plated "pewter" (zinc-based alloy), 20x11mm with double-sided flower design. Sold per pkg of 6. 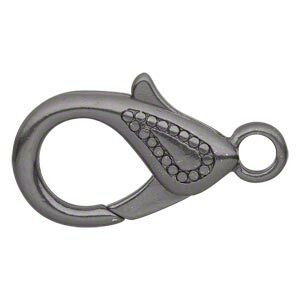 Clasp, lobster claw, gunmetal-plated "pewter" (zinc-based alloy), 25x13mm with double-sided smooth design. Sold per pkg of 6. 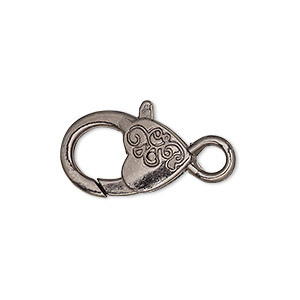 Clasp, lobster claw, gunmetal-plated "pewter" (zinc-based alloy), 20x13mm with double-sided fancy heart design. Sold per pkg of 8. 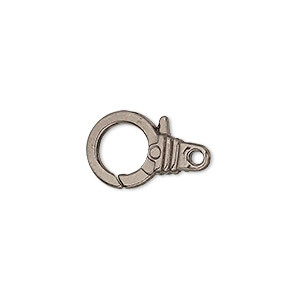 Clasp, lobster claw, gunmetal-plated "pewter" (zinc-based alloy), 15x12mm with double-sided ribbed design. Sold per pkg of 8. 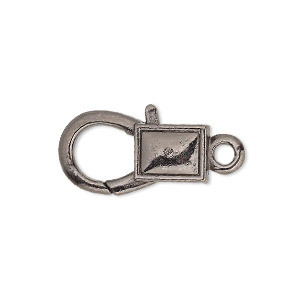 Clasp, lobster claw, gunmetal-plated "pewter" (zinc-based alloy), 22x12mm with double-sided smooth rectangle design. Sold per pkg of 8. 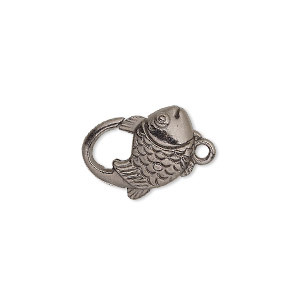 Clasp, lobster claw, gunmetal-plated "pewter" (zinc-based alloy), 17x12mm with double-sided fish design. Sold per pkg of 8. 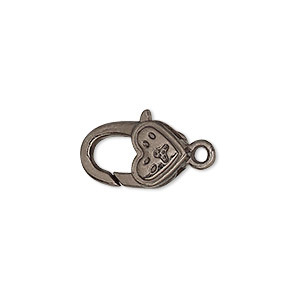 Clasp, lobster claw, gunmetal-plated "pewter" (zinc-based alloy), 17x10mm with double-sided paw heart design. Sold per pkg of 8.